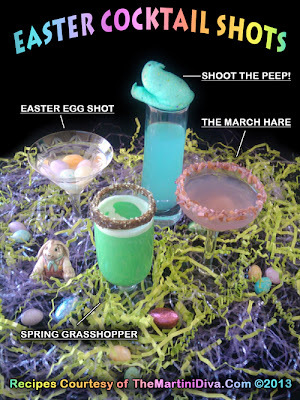 4 EASTER COCKTAIL SHOTS - Easter Eggs, Peeps and Booze! FOUR FUN COCKTAIL SHOTS FOR EASTER! Because who doesn't love Easter Peeps and Eggs in Booze? Melt the chocolate chips in the microwave. Dip the glass rim into the melted chocolate and then into the green sugar crystals. Add 1/2 cup of ice to a cocktail shaker and pour in the green Creme de Menthe, the white Creme de Cacao and the ice cream. Shake until well chilled then pour into the shot glass and serve. Add 1/2 cup of ice to a cocktail shaker, pour in the Hpnotiq and the cake vodka. Shake until well chilled then pour into your shot glass. Top off with the cake flavored marshmallow peep and serve. Add 1/2 cup of ice to a cocktail shaker, pour in the pomegranate and chocolate vodkas. Shake well then pour into a mini martini glass (aperitif glass) then drop in some of the Easter jelly beans. Dye some coconut flakes purple, then do a light toast on them in the oven. Rim your glass by dipping in some coconut cream then into the toasted coconut flakes. Add 1/2 cup of ice to a cocktail shaker, pour in the Harmonie and the coconut rum and shake until well chilled. Pour into your glass and serve. Looking for some larger cocktails?